sum-up of the wedding vibe: A laid-back foodie wedding in the Malibu Canyon Hills with lots of love, personal touches, and a bolo tie–wearing dog. If you include rentals, catering, and venue added up to about half of our overall budget. A top priority for us was that we found a venue that would allow for outside catering because we wanted to have the option to go the alternative catering route (this is LA, arguably the city of food trucks) and BYOB. While our venue didn’t include much for rentals since it was a private residence, it was still worth the cost because it came with two nights stay in an attached cottage, the owners were really flexible and amenable, and the cost of the venue also included all of the amazing café lights that were up around the property. The lights alone saved us a ton of money. Additionally, we really didn’t want a traditional caterer, and lucked out with finding a mobile pizza company that provided absolutely delicious fresh-made pizza and pasta. The food was a real highlight for us for the wedding, and though we splurged by doing some add-ons to the menu that we didn’t originally intend, it was still worth it to us. We wanted to make sure that our guests were well-fed and the pizza buffet ended up being perfect and exceeded our expectations. Another unforeseen expense was having servers and bartenders for the event, and we can’t stress enough how invaluable it was. With the nontraditional catering, we didn’t want to have to worry about having to ask guests to clean up, bus dishes, or set up, and were glad that even though they were a mobile eatery, they could still provide the extra staff. The rehearsal dinner was one of the last things we finalized, and we wanted to spend as little as possible on it because we had already exceeded our budget elsewhere. We teetered back and forth where to have it and ended up hosting at my parents backyard with a taco truck. It was really easy going, there was a ton of good food, and it was the turning point in planning. I finally relinquished control over how the wedding was going to be and began to just relax and enjoy the moment. For the cake, we prioritized taste over look so we went with getting a bunch of bundt cakes from Nothing Bundt Cakes. It cost us probably a quarter of what a wedding cake would have cost us and was absolutely delicious. While we found ourselves increasing our budget on vendors, it was really worth it to us to have the peace of mind that we were putting our wedding into good hands. We initially wanted to forego a DJ because we aren’t typically dancing people. During a short period of unemployment, I started working as a wedding coordinator’s assistant because I’d found wedding planning to become a bit of a hobby. Things I learned along the way: a DJ can make or break the vibe of your wedding. I found that if you had the wrong friend running your iPod or even if the song progression didn’t flow well, that guests’ participation could easily lull. We ended up going with a DJ that was reputable, though definitely more than we initially wanted to spend (we wanted to iPod it! ), but it was worth every penny. Our guests, who we originally thought weren’t the dancing crowd were on the dance floor all night. By the time the last song played it really seemed like they could have kept going. It was perfect. The food was totally worth it! We took the perspective of a wedding guest when planning the wedding, and we thought most about what would keep people happy: good food and good entertainment. It was so important to us that our guests were well fed, and we have no regrets about going over our food budget to make that happen. I loved the favors and got some great feedback about them but don’t know if it was worth the pain of figuring them out. I’m still not convinced anyone would have noticed if they hadn’t been there all along, and they were time consuming to make. I loved working on our website and set it up to collect RSVPs, but from all the questions I got about the wedding, it frustrated me to no end how few people went to the website for information. This is 2015! The one saving grace was I did have a tech-proficient friend who told me later that their invitation got lost in the mail and they were able to deduce pretty much every important detail about the wedding from finding the website address on our Save the Dates. Small victories. Google Drive: Since we chose a nontraditional wedding venue, keeping organized with all the vendors we had contacted and all the logistics that were going on was essential. Any documentation from email was automatically put in the drive in subcategories, and all spreadsheets I had accumulated and created were stored and organized; it really made juggling all of the different things in my mind maintainable. 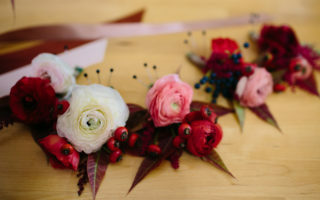 A day-of coordinator: Both from experiencing being a coordinator’s assistant and knowing all the planning that went into my own wedding, knowing that I had a go-to gal on the day-of was absolutely invaluable. Laurie from Pop the Champagne was on top of her game and helped so much constructing all the DIY elements I had for the day-of, leading all of the vendors to make sure everything went smoothly, and keeping us on time. The peace of mind of knowing someone else was in charge was absolutely worth it given all the different players involved in our wedding. Really take the time to research and choose your vendors. You are entrusting them with a year’s worth of planning into one day! Especially because we had to choose vendors remotely, and often didn’t hire them before meeting them in person (yay, Skype) we really made sure we were getting vendors we trusted and that would be able to handle our unique wedding. For example, we absolutely loved our photographer. She was warm and wonderful, and took beautiful photos, but we chose her foremost for her technical skills. We were having an all-outdoor wedding and from her portfolio, it was clear her forte was natural light photography. Listen to your gut: I am so used to emailing and sending out responses really quickly and knew that the vendors who had a similar response time were going to be the best vendors to work with. Having that connection early on, and getting a sense if your vendors will match your planning style is crucial. Plan for the cost of hiring help! We really wanted to make the experience for our guests as fun and easy-going as possible; we didn’t want to burden them with what was going on behind the curtains. If that’s the case, be prepared for the extra expense of having those staff people available and factor it into your budget. If you are planning a long-distance wedding and doing a lot of DIY, plan ahead on how to transport all of that. Literally every time family visited or we went down to SoCal we were bringing two full suitcases worth of DIY and décor. We were almost prepared to drive a U-Haul to our wedding. My husband and I both agree that our favorite part of the day was right after the ceremony and before we joined our cocktail hour. Our guests were heading down to the reception area, and we were taking a last few photos before joining cocktail hour. It was a chunk of time carved out of such a big day that felt like home, like us. Our caterers brought us a sampling of all of the appetizers and we gleefully tried them all, decompressed because “Holy moly, we were married,” and just had a really intimate moment with us two and our dog. It was us unabashedly taking delight in the day without any fuss, any thought about what we had to do, or who we had to say hi to, or what photo we still needed to take. It was just us pigging out with our dog in some fancy attire. 1. When my husband and I finally talked ourselves out of eloping, we agreed upon some fixed points that would motivate all of our wedding decisions: we had to have amazing, plentiful food that wasn’t going to blow the bank; we wanted an outdoor wedding; and we wanted to make it as easy as possible for our friends and family, such that they weren’t “working” on our wedding day. A majority of our guests were coming from out of town, and to add to all that, when we finally started planning we were in transition from moving out of SoCal to Seattle. This meant a lot of planning, staying organized, and staying on top of our vendors. At the end of the day, it was the motivation to make it more about the experience and not the appearance that made the wedding worth it. Throughout the whole day, I couldn’t get over how our guests really just seemed to be enjoying themselves and it made the planning, going over budget, all of it…. worth it. 2. We really wanted to mix in our favorite things into the wedding to make it personal. We kept it intimate by having family officiate and by writing our own vows. People seemed really moved by our ceremony, and though we left a lot of it in the hands of our officiants; it still felt really true to us. We had nods to my husband’s New Mexican and Texan heritage with all of the guys wearing bolo ties. We also love to hike and made our table numbers peaks we had summited over the years. 3. We are obsessed with our rescue dog and managed to incorporate him as much as possible during the wedding. We had ink stamps made that we used for our favors, we made life-size cutouts of his face for the photobooth, and he even walked down the aisle as a co-ringbearer, sporting a bolo tie as well. He definitely stole the show, and we were so glad that he was part of the experience. 4. Since we were having the wedding near Los Angeles, I decided I really wanted to take advantage of the LA Flower District by making my own floral arrangements for all of the centerpieces. I followed the APW guide and did two trial runs to make sure that I had a good sense of how long it would take and see what it would look like. I procured large buckets to transport the flowers (this was something I almost forgot to think about, but transportation of the flowers is a BIG DEAL!) and picked them up the morning before the wedding so that the flowers would open up and so that I would get the best pickings from the vendors. I also pre-ordered flowers from a couple of vendors I had gotten business cards from on a prior scouting trip because I had some flowers that I definitely knew I wanted (proteas! peonies!). I took scouting trips to the flower district so that I had a sense of what flowers would be in stock during that season (I went first about a year before the wedding), to talk to vendors, and pick up some flowers for mock-ups. I slowly collected a bunch of small bud vases from thrift stores. A note on the bud vases: I specifically chose bud vases since we were having long tables and they required very little skill to arrange. Luckily our venue was really flexible with bringing equipment for the wedding early so my mom, mother-in-law, and I prepared the flowers on site so that we didn’t have to worry about transporting the delicate arrangements. We also lucked out with the June gloom coastal weather because it stayed cool enough that we didn’t have to worry about figuring out how to store all of the flowers in a cool place. I didn’t feel skilled enough to do the arch or my bouquet and found an awesome florist who was able to work within a limited budget and still provide me a beautiful bouquet with my favorite flowers. It was definitely a case of me tempering what I was capable of doing myself with what was worth getting a professional for.